Girls’ Kickers Shoes: Kickers Girls’ School Shoes at Low Prices! If you’re looking for some new shoes to send your little lady off to school, look no further than these girls’ Kickers shoes. You want your school shoes to be smart, hard-wearing and high-quality. That’s exactly what you get with these girls’ Kickers school shoes. Kickers is a brand that we’re proud to stock. They’ve shown time and time again that they deserve your attention. Our team of in house buyers liked their shoes particularly because of their diversity. In patent or matte leather, with easy-fasten and t-bar designs, you can pick the pair that your daughter will love the most. She can run and play to her heart’s content on the playground and they’ll keep her feet warm and comfortable in the classroom. You don’t want to be buying multiple pairs of girls' school shoes throughout the school term, which is why you need these girls’ Kickers shoes. 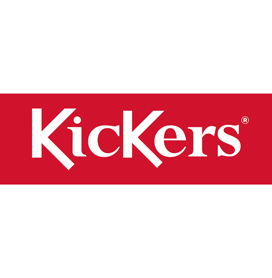 All available at low prices, Kickers is just one of the many great brands that we stock. We only stock shoes from makers that we know and can trust. We want to give our customers style and reliability at low prices. These smart girls’ black Kickers are exactly that. In our girls' shoes section, we have boots, trainers, slippers and more at competitive prices. All of our products come with free & fast delivery in the UK, because shouldn’t have to pay extra to get your hands on the shoes you want! 1 products from £34.99 to £34.99.